Garcia lived in the US since he was a child, when his family came as undocumented immigrants from Mexico. He had been facing an order of removal since 2009, but received extensions under the Obama administration. However, because of the Trump administration that is now in order, he was ordered to return to Mexico in November. 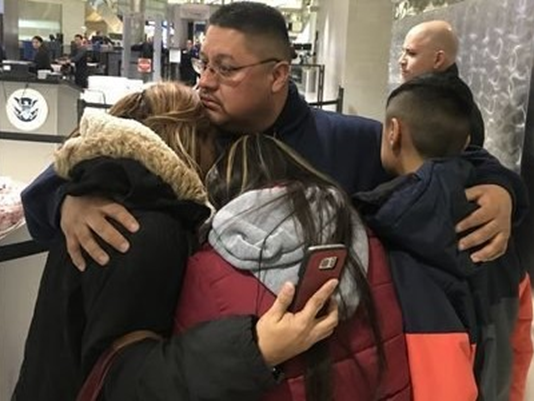 His family pleaded with Immigration and Customs Enforcements (ICE) to extend his time, hoping that a new DACA law (one with no age limit) would beput in place and would make him eligible. Sadly, this did not happen and Jorfge Garcia had to leave the country. “Yes, he was brought here at 10 years old and yes, he entered the country illegally, but he has no criminal record and his case needs to be looked at individually because he deserves to be here in a country that he’s known — not Mexico,” she said. Furthermore, she had to explain to her children that they need to be strong and that they are far from being the only family who are currently facing this situation. “It affects 11 million other people, but at least I can come forward and tell my story because I am a US citizen and I do not have to hide in any shadows,” she said.